Pictured (L-R): Alex Torrez, Kate Richardson, and John Richardson. Music consulting, artist development and publishing company Torrez Music Group has located its headquarters in the InDo Nashville building at 632 Fogg Street. Run by music entrepreneur Alex Torrez, the firm focuses on the representation of songwriters, artists, and other publishing affiliations to secure the correct placement of their music. InDo Nashville founders John and Kate Richardson have invited Torrez to join the co-working entrepreneurial space’s advisory board. 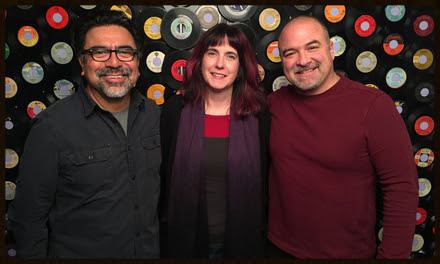 As a board member, Torrez will assist in promoting InDo’s songwriter memberships. Songwriters can join for unlimited access to the company’s three songwriting rooms. There are three levels of membership: Unlimited for $200/year, month-to-month for $30/month, and single 3-hour sessions for $20. “We are very excited to have Torrez Music Group operating out of InDo Nashville. Alex Torrez brings a wealth of experience and the positive energy that fuels the community at InDo,” says Kate Richardson, InDo Nashville co-owner and partner in Richlyn Marketing. “I’m thrilled and honored to be asked to be a part of this amazing facility and work along side John and Kate Richardson. I’m looking forward to what 2016 brings!” adds Torrez. Missing Piece Group, a New Jersey-based PR, marketing, and management company, has opened a new office in Nashville. The Music City outpost will be led by General Manager Brady Brock. Brock previously worked for 10 years at Gold Village Entertainment, and brings clients Blitzen Trapper and White Zombie to the Missing Piece Group roster. Missing Piece Group’s roster also includes Colony House, Ryan Culwell, Andrew Combs, Great American Canyon Band, and Chris Collingwood. Additionally, Joe Sivick has been promoted to the role of VP, Publicity. Missing Piece Group was founded by Krumper in 2008 and celebrated its seventh anniversary in December. The company has engaged in publicity and marketing campaigns for clients such as Amazon Music, Melissa Etheridge, Halsey, Hill Country BBQ, Jon Langford, Tom Jones, Ashley Monroe, Rosanne Cash, Sean Watkins, Sloan, Ben Watt, Yanni and more. Brock can be reached at brady@missingpiecegroup.com. Recording artist Ayla Brown has been added to the C2 Media Relations roster, joining Lonestar, Curb Records Ashley Gearing, Lucy Angel, Trick Pony and more. Brown made her debut in 2006 as a finalist on American Idol. Most recently, she has performed on NFL’s Monday Night Football and the GOP debate on CNN.